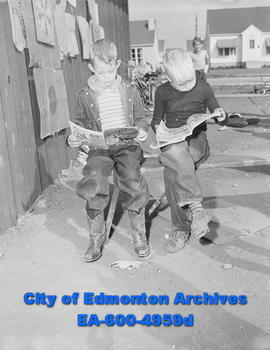 Two boys reading at Glenora's playground fair. 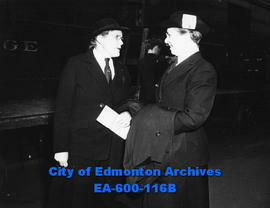 Unidentified Girl Guide official and Mrs. S. H. Gandier at the CNR station as Mrs. Gandier arrives for the annual meeting in Edmonton. Unidentified female veteran at Convention of Provincial Command, Canadian Legion, Edmonton. Unidentified veteran at Convention of Provincial Command, Canadian Legion, Edmonton. Unidentified woman, Lt. Gov. J. C. Bowen, H. R. Milner, Dr. A. W. Trueman, Mrs. Bowen, Edmonton United Campaign banquet, Edmonton. Bowen, J. C.Milner, H. R.Trueman, Dr. A. W.Bowen, Mrs. J. C.
United Farmers of Alberta directors elected at the annual convention: (L-R) J. A. Cameron, V. C. Flint, G. L. Pritchard and W. H. Ward. United Farmers of AlbertaCameron, J. A.Flint, V. C.Pritchard, G. L.Ward, W. H.
United Farmers of Alberta executive elected at the Macdonald Hotel: (L-R) Donald MacLeod, M. H. Ward, Mrs. M. E. Lowe, George E. Church and A. B. Wood. United Farmers of AlbertaMacdonald HotelMacLeod, DonaldWard, M. H.Lowe, Mrs. M. E.Church, GeorgeWood, A. B. United Farmers of Alberta executive elected at the Macdonald Hotel: (L-R) R. Hennig, Donald MacLeod, M. H. Ward, Mrs. M. E. Lowe, George E. Church and A. B. Wood. United Farmers of AlbertaMacdonald HotelHennig, R.MacLeod, DonaldWard, M. H.Lowe, Mrs. M. E.Church, GeorgeWood, A. B. University Women's Club meeting. Mrs. C.C. Higgins, Mrs. Roy Anderson, Mrs. Morden H. Long. Higgins, Mrs. C.C.Anderson, Mrs. RoyLong, Mrs. Morden H.
University of Alberta Curling competition. Competitors for the Matthews Shield: (L-R, T-B) Neil Moher, Wally Worth, Bob Campbell, Frank Boyle; Bill Lyn, Jim Riley, Brant Kirby and Ron Goliss.